Ah yes, Valentines Day is afoot. The one day a year where singles are shunned and romantic cynics are born. Being the perpetual singleton through all these years of gawdy pink hearts filled with chocolate and forced messages of affection being inflicted on so many “romantics”, I can say I am not a fan. So, for those of you who are happily in love (as cynical as I am, I still believe in romance), and for those of you who don’t know what you are missing (you don’t know who you are, but I do 🙂 ), I present this treat. 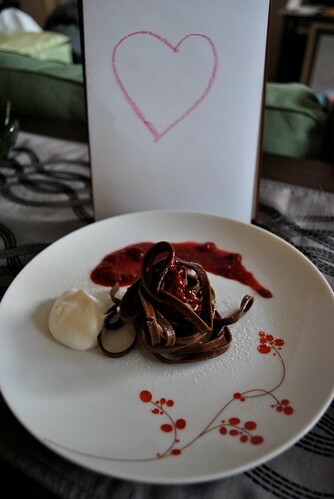 Chocolate linguine with a raspberry wine sauce. Love, with strings. I found this pasta on my last trip to Seattle. 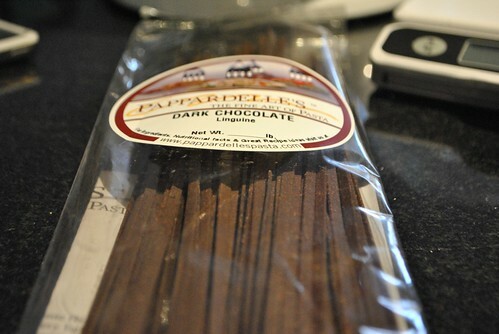 While roaming Pikes Place Market, I heard one of the vendors offering up samples of a Dark Chocolate Linguine. What? I stopped in my tracks, I had to try this. So I sampled a strand of the dry pasta, and ended up buying a package. It is really easy to cook. Big old pot of boiling water, in went the pasta, and cook until al dente. Once it was done, I drained it and tossed it with a very slight drizzle of olive oil, just to keep it from sticking too much. 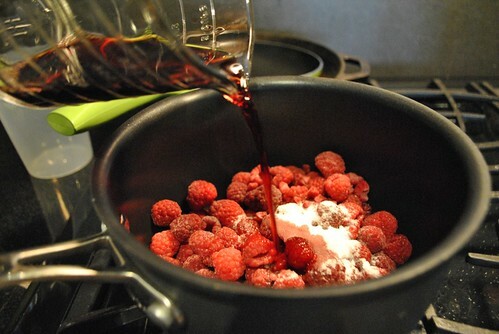 To make the sauce, I followed this recipe from Godiva for their Raspberry Red Wine Reduction Sauce. 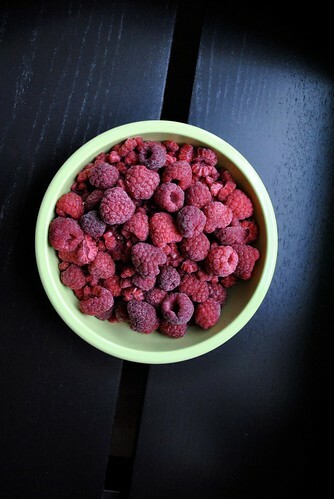 In a saucepan, I put in one package of frozen raspberries, not quite 1/4 cup of sugar and a half cup of Red Wine. 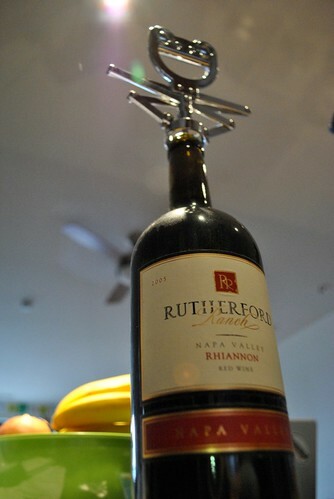 I used a bottle of red wine I had bought on a trip to Napa Valley years ago. Bring it all to a boil, and then let it simmer. Mine simmered for more than the prescribed 5 minutes. At one point I had the pasta cooking to the right of me, and the raspberry red wine reduction to the left of me. Oh, let me tell you how good everything smelled. There chocolate wafting in the air mixing with the red wine and raspberries cooking away. To serve, I twisted a little bundle of pasta, and topped with a little of the red wine sauce. I also hand whipped some heavy cream with the insides of half of a vanilla pod and a spot of sugar (Didn’t even take 5 minutes). And dusted the final dish with a powder sugar cayanne pepper mix. The pasta was so chocolatey and wonderful. It was so hard to stop myself from eating all the left over pasta while standing at the counter. The sauce was sweet, and the could probably use a little less sugar. 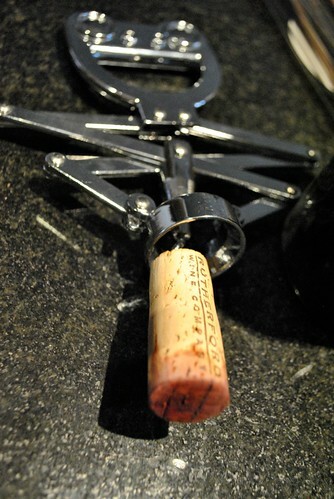 For something like this, be sure to use a wine you really do like to drink because the flavors really come through. I also served it un strained because I thought the dish could use an added dimension of texture, but honestly, it’s probably better if you strain it. Unless you find the possibility of raspberry seeds in your valentines teeth romantic. 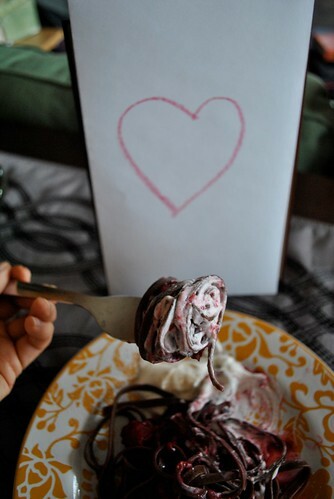 The finished product was fun, sweet, winey and just a bit messy, just how love should be. Hopefully with this dish you can have your own Lady and the Tramp moment. This entry was posted in Dessert, Uncategorized and tagged chocolate, Pasta, raspberries, red wine. Bookmark the permalink. Chocolate pasta? You, lady, are speaking my language. This sounds awesome!